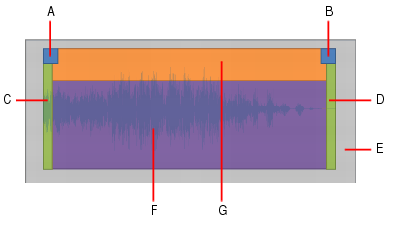 The Smart tool is the default tool in SONAR. The Smart tool is a multi-function tool that combines functions from several other tools. The function is determined by where you click. Click the Smart tool button in the Control Bar. Press T to display the Tools HUD, then select the Smart tool. Clips are drawn with a header, which can be clicked with the Smart tool to select and move the clip. 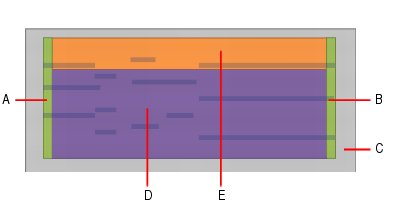 Clip headers automatically disappear if the track height is less than 36 pixels. Figure 166. Clip headers are visible when clips are higher than 36 pixels. 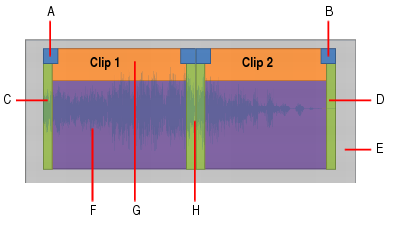 See also To hide clip headers and maximize clip waveform display. Note: The Smart tool behaves differently when editing takes in Take lanes. For details, see Using the Smart tool in Take lanes and Comping with the Smart tool and Comping tool. 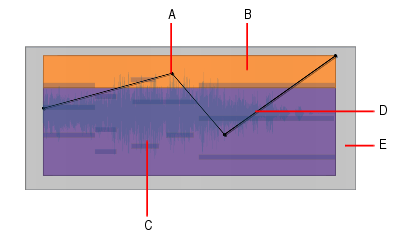 Figure 167. Smart tool hotspots on audio clips. Note: If the clip contains a fade in, drag the top half to crop clip start and move the fade in, or drag the bottom half to only crop the clip without moving the fade in (does not apply when editing in Take lanes). Note: If the clip contains a fade in, drag the top half to crop clip start and move the fade in, or drag the bottom half to only crop the clip without moving the fade in. Note: If the clip contains a fade out, drag the top half to crop clip end and move the fade out, or drag the bottom half to only crop the clip without moving the fade out (does not apply when editing in Take lanes). Note: If the clip contains a fade out, drag the top half to crop clip end and move the fade out, or drag the bottom half to only crop the clip without moving the fade out. Note: Click the clip header to select the clip, or drag the header to move the clip. Figure 168. Smart tool hotspots in Take lanes (two split clips shown). Drag the top half to select by time. Drag the bottom half to isolate. Click the bottom half to isolate clip. Drag the bottom half to split across lanes and Isolate clip. Click the top half to select clip or drag to select by time. Click the clip header to select the clip, or drag the header to move the clip. Drag left/right to move split point on all Take lanes; if crossfade exists, move the crossfade. Drag the top half to crop a single clip. Figure 169. Smart tool hotspots on MIDI clip. Figure 170. Smart tool hotspots on PRV notes. 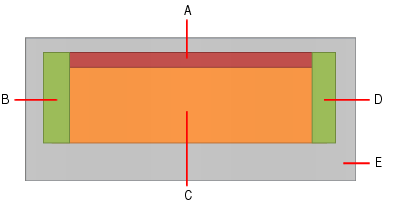 Figure 171. Smart tool hotspots on automation. Figure 172. Smart tool hotspots on AudioSnap transients.